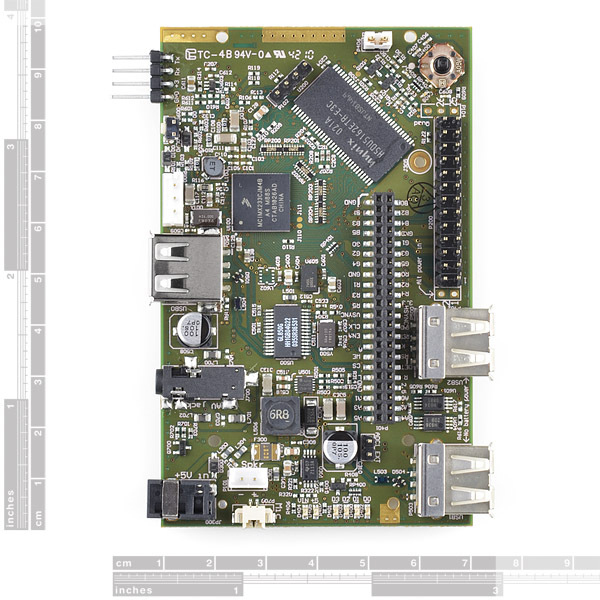 Chumby is now offering a “hacker” board, which is the guts of the Chumby One , but modified to be more hacker-friendly. It comes with three high speed USB host ports, uses the power connector from the Sony PSP (instead of the weird, hard to find connector on the Chumby One) and incorporates a variety of headers, such as Arduino-style shield headers and a 44-pin breakout header that gives you access to a lot of digital I/O and some analog inputs. There’s even a four-directional switch on board and some LEDs so you can do quick hacks that don’t require a video display for user feedback. 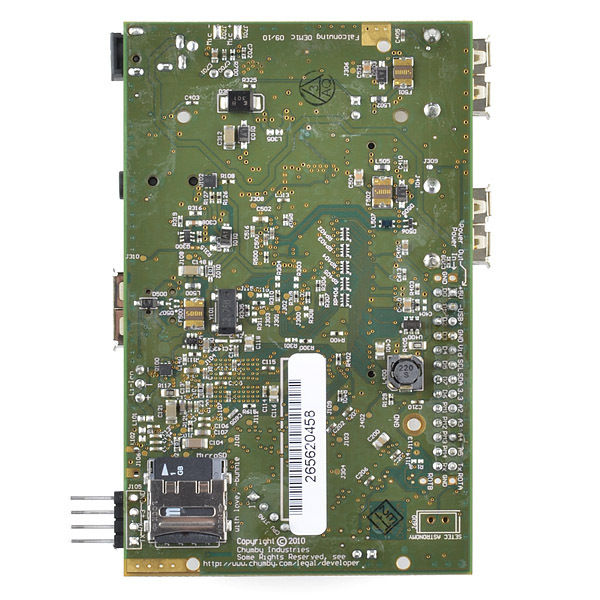 Speaking of the display, while this board doesn’t come standard with an LCD, it does provide composite video output via a 4-wire 1/8″ jack so you can, by using an iPod video cable, plug the chumby hacker board into any TV that supports a composite video input. 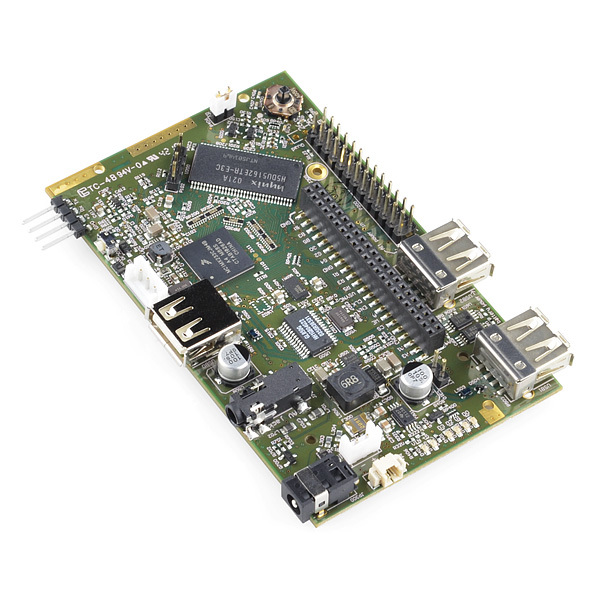 Note: We are now shipping v1.0, which is the current version of the board. Anyone ever got a PSP LCD to work with either this board or a stock Chumby? would make for a nice kit if it worked. Does this thing have WiFi or an TCP/IP connection of sorts? I figured out I2C communication between the Chumby Hacker and an Arduino (with the Arduino as a slave). It requires some changes to the I2C C code examples given by Ladyada. If you're interested, here is the document. I will be glad to see sparkfun sell breakout boards that enables one to connect chumby's lcd to this board. Can some SFE person please confirm these are the fixed v1.0 boards and not the beta boards? The description suggests they are the beta boards (the 1.0 has no Arduino headers). Is it safe to assume the serial console is bus pirate compatible? It works: GND to GND, MOSI to Rx, MISO to Tx. Select mode "UART", 115200bps, Bits/Parity 8/none (default), a stop bit (default), default polarity, "normal" H=3.3V output (not default). Run the "Transparent UART bridge" macro (that's "(1)" on my bus pirate, other revisions may vary) for a typical interactive terminal - easiest to connect the bus pirate, set up the serial connection, then power up the chumby and watch it boot. This would be great if only it could support Actionscript 3.0 programming with Flash Lite 4, Flash Player 10.1, and/or AIR 2.0 running on top. Chumby has been Actionscript 2.0 based for far too long :-( Any updates on when we can actually program for chumby with Actionscript 3.0??? chumber: Which FTDI cable should be ordered from Sparkfun that works with this board? Which FTDI cable should be ordered from Sparkfun that works with this board?